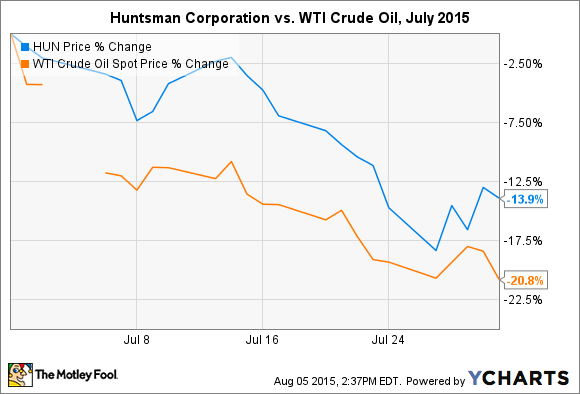 Here's what you need to know about Huntsman's recent stock decline. What: Chemical manufacturer Huntsman Corporation (NYSE:HUN) fell 14% in July, although the move would have been worse if not for solid second-quarter earnings released on July 29. What's going on here? So what: The reason for the drop is pretty simple and, unfortunately, completely out of the company's control: crude oil prices. Many chemicals are manufactured from petroleum derivatives -- thus "petrochemicals." The good news is that while revenue and earnings are lower in 2015 compared to 2014, Huntsman Corporation is still profitable and still owns healthy and efficient operations. Revenue for the first six months of the year was down 7.2% compared to the year-ago period, although EBITDA fell 36%. However, adjusted EBITDA, which takes the strong dollar and scheduled maintenance into account, only fell 2.2% for the comparable period. It's still something to keep an eye on in the next few quarters to make sure things don't deteriorate past your comfort level. Now what: Crude oil prices that are currently lower than in previous years will continue to affect companies that are heavily affiliated with commodity markets, such as Huntsman Corporation. While commodity prices could remain lower for longer than anyone expects, at this time I don't see any reason to worry too much about this stock.